Benefiting the New Mexico Pharmaceutical Care Foundation & UNM College of Pharmacy student pharmacists in cooperation with AmerisouceBergen and other generous donors. REGISTRATION BEGINS AT NOON | TEE OFF AT 1PM | Box lunches provided for all players. Range balls provided for all players. Golf course officials will notify golfers of rules and tee assignments. The 90th Annual Convention will provide Continuing Professional Education to Pharmacists, Pharmacy Technicians and other health care professionals. Saturday there will be exhibitors providing information about products and services. RESERVE BY JUNE 4, 2019 to receive $119 NMPhA Group Rate! The New Mexico Pharmacists Association is accredited by the Accreditation Council for Pharmacy Education (ACPE) as a provider of continuing pharmacy education. Pharmacists and other health professionals may earn up to 12.0 contact hours or 1.2 CEU’s by participating and successfully completing a program evaluation form for each program attended. (There are concurrent programs, an individual can earn at the most 12.0 or 1.2 CEU’s.) NMPhA will submit your completed CPE hours into the CPE Monitor database within 60 days to attendees who have successfully completed a Program Evaluation Form. NOTE: Statements of Credit will not provided unless all appropriate fees are paid. TARGET AUDIENCE: Pharmacists, pharmacy technicians and pharmacy students. GRIEVANCE POLICY: If, for any reason, a participant is unsatisfied with one program or the entire program, that participant must file his/her grievance, either by phone or in writing, with the NMPhA office within ten business days of the program in order to determine the refund amount. If the individual(s) remain unsatisfied with the response from the NMPhA Program Administrator, he/she may request to appeal the situation before the Association’s Executive Council at the next scheduled meeting. Such an appeal may be done either in person or in writing. All expenses pertinent to such an appeal shall be borne by the individual(s) requesting the appeal. REFUND POLICY: Up to five days prior to the program, a refund less a $25 administrative fee may be obtained. NO REFUNDS after June 17, 2019. Refunds will not be granted for no shows. 2019 NMPhA 90th Annual Convention EXHIBITORS! Profile of attendees: Attending are Pharmacists from all areas of practice as well as other healthcare professionals. Attendees include: Community Pharmacists; Independent Pharmacy Owners; Consultant Pharmacists; Chief Pharmacists; Hospital Pharmacists; Professors and Students from UNM College of Pharmacy; Pharmacist Clinicians; New Mexico Board of Pharmacy Members and Drug Inspectors and Staff; Certified Nurse Practitioners; Certified Nurse Midwives; Physician Assistants; Certified Pharmacy Technicians (CPhT); and Pharmacy Technicians. Booth Assigned: Upon receipt of your exhibit fee you will be listed as an exhibitor in our Annual Convention Program. Booth locations are assigned on a first-paid basis. Cost: $800 - $1300. If your company is sponsoring a speaker and NMPhA is not processing a grant request from your organization, the fee is waived. However, we still need the form. Refund Policy: Up to three weeks prior to our Convention a refund, minus a $50.00 administration fee may be obtained. No refunds after Friday, June 14, 2019. No refunds for no shows! by calling (505) 821-3333 or or Toll Free (800) 228-9290. Reservations received after this date will be confirmed on a space available basis only. 1) Analyze the cause, transmission and pathogenesis of tuberculosis, specifically latent tuberculosis infection and its progression to tuberculosis disease; 2) Discuss significant recent trends in the epidemiology of tuberculosis and identify populations in the United States and New Mexico at high-risk of latent tuberculosis infection and progression to tuberculosis disease; 3) Discuss the limitations inherent in the Mantoux tuberculin skin test, how those limitations might affect tuberculin skin testing in the pharmacy setting and current alternatives to the Mantoux tuberculin skin test; 4) Compare the components of a targeted tuberculin skin test health history/risk assessment and their significance in interpreting tuberculin skin test reactions; 5) Demonstrate the correct technique for administering the Mantoux tuberculin skin test; 6) When presented with Mantoux tuberculin skin test reactions and accompanying health histories, participant will be able to demonstrate the correct technique for reading/interpreting these reactions and documenting the results and 7) Identify patients who would benefit from referral for further medical evaluation and describe the appropriate referral process. 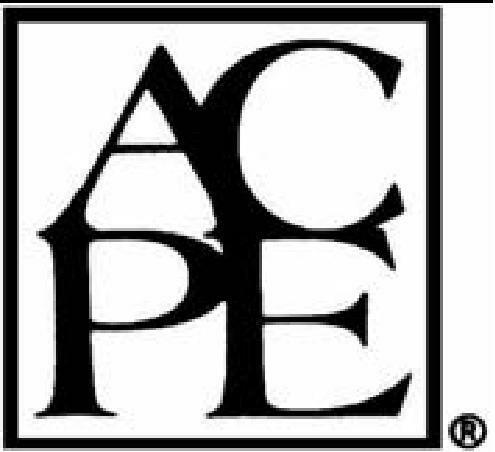 Accreditation Council for Pharmacy Education (ACPE) as a provider of continuing pharmacy education. This program provides 3.0 contact hours (0.3 CEUs) of continuing pharmacy education credit. The application-based program is designed for pharmacists. The additional knowledge-based home-study webinar offers 1.0 contact hr. (0.1 CEU) CPE credit. Participants are required to turn in a completed program evaluation form to receive the designated CEUs. Your CPE credits will be submitted into the CPE Monitor Database within 60 days based on the information provided on this form. ACPE Program # 0104-9999-17-052-H04-P (Pharmacists) / Initial Release Date: 8/15/17 Pre-Requisite: Introductory webinar required. The link above will take you to the home-study webinar. This is a very large file, so please allow up to 4-5 minutes for it to download. ACPE CREDIT & CERTIFICATION: Upon completion of the webinar, pharmacists requesting 1.0 contact hour of ACPE credit will be required to download and complete the program evaluation and forward to NMPhA. "Prescriptive Authority for Hormonal Contraception"
MUST BE A CURRENT NMPhA MEMBER OR CHAIN DRUG COALITION MEMBER prior to registering for course. This course consists of 4 hours of home-study and 2 hours of live training. You must successfully complete the home-study portion prior to getting registered for the live session. Please contact Julie Weston at the NMPhA office with any questions at jweston@nmpharmacy.org or 505-265-8729. Once you have registered and paid, UNM will forward Moodle log-in instructions within 24 - 48 hrs. Upon completion of this knowledge-based program, participants will be able to: 1) Explain the need for Pharmacist Prescribed Contraceptives in New Mexico; 2) Define what family planning means, the role of family planning programs, and cost savings by family planning programs for families and communities; 3) Introduce the US MEC Summary Chart and its use and review its history; 4) Present and review the documents/protocol created for New Mexico Pharmacist Prescriptive Authority for contraception; 5) Identify available contraceptive methods and mechanism of action/effectiveness of available contraceptives; 6) Define common side effects of HC and how to manage those side effects appropriately; 7) Describe important features of effective communication with patients and proper patient communication techniques to be used in the pharmacy for successful outcomes; 8) Review how to help the patient choose the best method based on a focused health history and individual needs, the significance of informed consent and the proper consenting process, and confidentiality needs of the patient and 9) Describe a workflow process in pharmacy practice to furnish patients with self-administered contraceptives. Upon completion of this knowledge-based program, participants will be able to: 1) Provide a brief review of key facts concerning hormonal contraception; 2) Review sample patient cases; 3) Offer the opportunity to ask questions and clarify issues in providing hormonal contraceptive care; 4) Identify the best resources for building clinical skills and 5) Offer pharmacy-specific practice suggestions. DOWNLOAD USMEC APP AND HAVE AVAILABLE DURING THE TRAINING! Participants are required to turn in a completed program evaluation form to receive the designated CEUs. Your CPE credits will be submitted into the CPE Monitor Database within 60 days based on the information provided on this form. Full NM HC prescriptive authority will not be acknowledged until the full 6 hour training is complete, a passing quiz grade and full payment has been received. Accreditation Council for Pharmacy Education (ACPE) as a provider of continuing pharmacy education. This knowledge-based program provides 4.0 contact hours (0.4 CEUs) of continuing pharmacy education home-study credit and is designed for pharmacists. The additional knowledge-based live program offers 2.0 contact hrs. (0.2 CEUs) CPE credit. Participants must have a passing grade of 80% on the home-study quiz and are required to turn in a completed program evaluation form to receive the designated CEUs. Your CPE credits will be submitted into the CPE Monitor Database within 60 days based on the information provided on the program evaluation form. 2019 Training Dates TBD - Based upon demand. *Please note: Live attendees will be charged an additional $8 for a parking pass. If you don’t register at least 1 week prior to the training, limited pay stations will be available on site. Friday, April 05, 2019 "Tuberculin Skin Testing in New Mexico Pharmacies"
Friday, October 05, 2018 "Tuberculin Skin Testing in New Mexico Pharmacies"
Friday, July 06, 2018 "Tuberculin Skin Testing in New Mexico Pharmacies"
Friday, April 06, 2018 "Tuberculin Skin Testing in New Mexico Pharmacies"
Wednesday, February 21, 2018 "Tuberculin Skin Testing in New Mexico Pharmacies"
Friday, January 05, 2018 "Tuberculin Skin Testing in New Mexico Pharmacies"
Friday, October 06, 2017 "Tuberculin Skin Testing in New Mexico Pharmacies"
Friday, July 07, 2017 "Tuberculin Skin Testing in New Mexico Pharmacies"
Friday, April 07, 2017 "Tuberculin Skin Testing in New Mexico Pharmacies"
Friday, November 04, 2016 "Tuberculin Skin Testing in New Mexico Pharmacies"
Friday, September 02, 2016 "Tuberculin Skin Testing in New Mexico Pharmacies"
Friday, July 01, 2016 "Tuberculin Skin Testing in New Mexico Pharmacies"
Wednesday, March 09, 2016 "Tuberculin Skin Testing in New Mexico Pharmacies"
Friday, September 11, 2015 What’s New in Diabetes Medications & Treatments?